Campeggio Les Plages de Beg-Léguer si trova a Becléguer, Côtes-d'Armor, è situato vicino al mare. Questo campeggio dispone di piazzole delimitate, sia ombreggiate che e piazzole poco ombreggiate. Camping Les Plages de Beg-Léguer si trova nei pressi di una spiaggia di sabbia. È possibile affittare casemobili e bungalow. Il campeggio dispone di un parco giochi e di un campo sportivo. Per gli sportivi, il campeggio prevede diversi percorsi in bicicletta. Il campeggio dispone di una piscina scoperta, una piscina coperta con copertura scorrevole e una vasca per i più piccoli. C'è anche uno scivolo d'acqua presente. Nelle immediate vicinanze potete fare il bagno in mare. Al campeggio Camping Les Plages de Beg-Léguer è possibile praticare snorkeling, windsurf e canyoning/canoa/rafting. Non è sempre necessario cucinare, perché all’interno del campeggio ci sono snackbar, pizzeria e ristorante con menù poche portate presente. In campeggio è possibile acquistare pane fresco. Potete navigare su Internet, poiché il campeggio dispone di uno o più computer con collegamento a Internet e nell'80% del campeggio potete navigare con il vostro portatile. Ogni anno un ispettore visita il Campeggio Les Plages de Beg-Léguer, controllando oltre 200 tra attrezzature e altri punti di interesse del campeggio. L'ispettore è un dipendente ACSI e non lavora per il campeggio. A very nice campsite close to a very good beach. Local area has great walks and some fantastic beaches. Acces is good and pitches are large with a mix of shade and sun. Front pitches have superb views out to sea but can have winds so strap down. Staff are very good, speak good English and help out all the time. Busy but pitches well spaced out and lots of room. Relaxing atmosphere and we would recommend this site. We stayed here for 4 nights at the end of June on our way to the Roscoff ferry about an hour away. The pitches are large with good access and well maintained with pleasant outlooks. The unisex sanitaires are clean and also well maintained. The staff were excellent and spoke good English. The wifi is free and works! Altogether an excellent site. There is a restaurant 10 minutes away on the beach ( how do you want your mussels?) but our favourite was a cafe at the main road turn-off for lunch. Full of local workers, great atmosphere and good food. The area is typical rugged Brittany and Lannion has all the facilities you could need. We shall return. Excellent site, very friendly staff. Minutes from a beautiful sandy beach with safe bathing, ideal for families. This is an excellent campsite. Stunning views, lovely sandy beach, great for swimming, rocks for fishing from, impressive pools and slides complex, free wifi all over, very big flat pitches, showers hot and lots of water pressure, toilets spotless - I could go on but the simple message is this is a really good site on a slightly quieter part of the coast - very hard to beat. Beautiful location on the Granit Rose coast with lovely walks from campsite. Good food shopping only a short drive away. This is a beautiful campsite in a wonderful position overlooking the beaches of Beg Leguer which can be reached via several different paths - be aware though, walking down to the beaches means you have to walk up afterwards! In June we could take our dog on all the beaches except one. The owner is a charming man who speaks excellent English. The sanitation block was a bit dated, but absolutely immaculate and very clean with lovely hot showers. There is an excellent indoor swimming pool complex too. When we were there the weather wasn't that good and the campsite was very quiet and we had a huge pitch all to ourselves. We don't have children but noted that there is a very good children's play area. The siting of the electricity points is a bit eccentric so you have to choose your pitch carefully if you don't have a very long extension lead. Overall we thoroughly enjoyed our stay at this site and in fact were only intending to stay one week and stayed two. Highly recommended. Volete prenotare il Campeggio Les Plages de Beg-Léguer o oppure saperne di più? Potete farlo usando i seguenti dati. Lannion-Trébeurden (9 km in tutto). Dopo circa 6 km uscire a Champ Blanc (Bar-Tabac/Resto-Bar) verso Les Plages de Beg-Léguer. (Meglio non attraversare Servel). Attenzione: dal 13 luglio 2015 è stato vietato a molti campeggi francesi di installare cartelli e frecce di indicazione stradale. Per trovare un campeggio, si consiglia quindi di utilizzare le coordinate GPS. 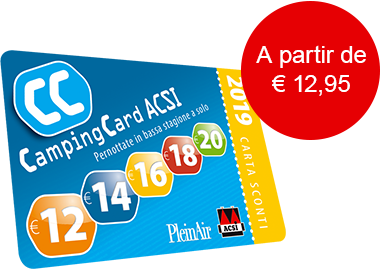 ACSI Eurocampings invia la tua richiesta di informazioni al "Campeggio Les Plages de Beg-Léguer".